Inspiration for future work? » Medieval knights? "after battle scene"? Tired, wounded, resting, crying, depressed knights and fighters? soldiers/knights that dresing up and go through equitment. knight putting on helmet, simple but good. Crew for the ship - great! We need more sailors!!! Two Sergeants twisting and fighting , some who tries to calm them . Good for a campscene , i think that happens when Soldiers have time and wine . For a battle set : foot soldiers being shot down by some archers/crossbowmen. More dead or dying men to complete the battle scene. Cheering soldiers or hugging could be usefull as camp life or battle. Well, many thanks for the ideas. If anyone can help with pictures this would be much appreciated. This is one of the many things I like in Valdemar's. They are always asking their clients about what they want!! 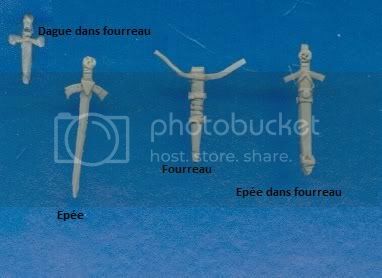 I currently make weapons & accessories at the 1/72, here a photograph of my prototypes which are not yet finishes, then I make moulds, if that can interest you. they are very interresting. For example to use it at battlefields, some swords and so on lying on the ground. Hello, like says it one of the members it also misses dead figurines but into full action kind receiving an arrow or a blow with sword, figurines wounded with knee being held with a hand on the ground or with the 2 hands on the belly, a knight mourrant in the arms of another who is with knee what to return more viviant one scene of battle. Why not figurines which sleep, even also of the prisoners, I would see well also peasants & country-women during the agricultural work even which flees in front of arrived men-at-arms.